The veterinarians at Pet Poison Helpline receive hundreds of calls this time of year from pet owners and veterinarians concerning cats that have ingested Easter lilies. “Unbeknownst to many pet owners, Easter lilies are highly toxic to cats,” said Ahna Brutlag, DVM, MS assistant director at Pet Poison Helpline. 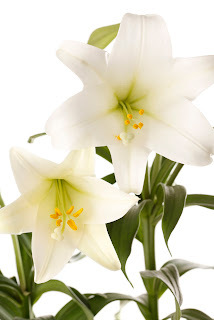 “All parts of the Easter lily plant are poisonous – the petals, the leaves, the stem and even the pollen. Cats that ingest as few as one or two leaves, or even a small amount of pollen while grooming their fur, can suffer severe kidney failure.” In most situations, symptoms of poisoning will develop within six to 12 hours of exposure. Early signs include vomiting, loss of appetite, lethargy and dehydration. Symptoms worsen as kidney failure develops. Some cats will experience disorientation, staggering and seizures. “There is no effective antidote to counteract lily poisoning, so the sooner you can get your cat to the veterinarian, the better his chances of survival will be,” said Brutlag. “If you see your cat licking or eating any part of an Easter lily, call your veterinarian or Pet Poison Helpline immediately. If left untreated, his chances of survival are low.” Treatment includes inducing vomiting, administering drugs like activated charcoal (to bind the poison in the stomach and intestines), intravenous fluid therapy to flush out the kidneys, and monitoring of kidney function through blood testing. The prognosis and the cost – both financially and physically – to the pet owner and cat, are best when treated immediately. There are several other types of lilies that are toxic to cats as well. They are of the Lilium and Hemerocallis species and commonly referred to as Tiger lilies, Day lilies and Asiatic lilies. Popular in many gardens and yards, they can also result in severe acute kidney failure. These lilies are commonly found in florist bouquets, so it is imperative to check for poisonous flowers before bringing bouquets into the household. Other types of lilies – such as the Peace, Peruvian and Calla lilies – are usually not a problem for cats and may cause only minor drooling. Thankfully, lily poisoning does not occur in dogs or people. However, if a large amount is ingested, it can result in mild gastrointestinal issues such as vomiting and diarrhea. Pet Poison Helpline also receives calls concerning pets that have ingested Easter grass and chocolate. Usually green or yellow in color, Easter grass is the fake grass that often accompanies Easter baskets. When your cat or dog ingests something “stringy” like Easter grass, it can become anchored around the base of the tongue or stomach, rendering it unable to pass through the intestines. It can result in a linear foreign body and cause severe damage to the intestinal tract, often requiring expensive abdominal surgery. Lastly, during the week of Easter, calls to Pet Poison Helpline concerning dogs that have been poisoned by chocolate increase by nearly 200 percent. While the occasional chocolate chip in one cookie may not be an issue, certain types of chocolate are very toxic to dogs. In general, the darker and more bitter the chocolate, the greater the danger. Baker’s chocolate and dark chocolate pose the biggest problem. The chemical toxicity is due to methylxanthines (a relative of caffeine) and results in vomiting, diarrhea, hyperactivity, an abnormal heart rhythm, seizures, and possibly death. Other sources include chewable chocolate flavored multi-vitamins, baked goods, or chocolate-covered espresso beans. If you suspect that your dog ate chocolate, call your veterinarian or Pet Poison Helpline immediately. Spring is in the air and Easter is a wonderful holiday. Remember that your pets will be curious about new items you bring into your household like Easter lilies, Easter grass and chocolate. Keep them a safe distance away from your pets’ reach and enjoy the holiday and the season.